Do you feel lost when you try to think of ways to generate leads for your business? In the wake of Google’s Panda and Penguin updates, which, as you’re aware, dealt a disastrous blow to many websites, the search engine giant has not been coy about its desire to see more fresh, relevant, and original content on websites. You know the drill. “Content is king” has been the mantra on many marketers’ minds for more than a few years. In my experience, content marketing has proven to be very effective when done right. But you probably already know all that. What you most likely really want to learn is how to better use content marketing for lead generation. What types of content yields results, and which don’t? More importantly, how do you use specific types of content to capture leads? Here are some of the best methods that I’ve tried, tested, and observed to produce outstanding results. According to an industry forecast by PricewaterhouseCoopers, total revenue from e-book sales are expected to hit nearly $8.7 billion in 2018, an increase of over 3,000% since 2008. What’s more, the United States is expected to reach 112 million e-book readers by 2020. All of that represents a huge market just waiting to be tapped, which is why creating and releasing an e-book is a strategy that has proven to be highly effective at capturing leads. Let me walk through each of those points. A well-written e-book should offer something of real value to readers who can walk away with specific answers to questions that urged them to read the material. The e-book usually is the first contact point between you and the reader, so it’s absolutely critical that you deliver the information you promised in your landing page or email, otherwise you’ll end up killing your reputation and any relationship you might have had with your audience. Do you want to show people what you know about a certain subject or industry? Then write it down in an e-book. Unlike blog posts — even long ones — an e-book really lets you discuss a subject in an in-depth manner. The deeper you go into a topic, the more information readers will get from you. This, in turn, will increase your e-book’s value. People will see you and your e-book as rich sources of information, and will expect to get more valuable information from you in the future. Perhaps the most overlooked aspect of making an e-book is that it allows you to collect your readers’ email addresses, effectively putting them in your sales funnel. The success of this phase, however, ultimately depends on your landing page, which is where you let readers know what information is in your e-book, why it’s worth their time, and why it’s fair to ask for their email address in exchange. When creating a landing page for your e-book, I like to refer to a summary of the basic elements of a great landing page, similar to the example by Wishpond. 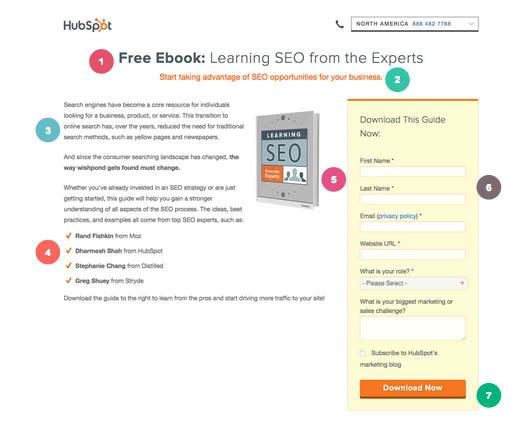 You can also use Unbounce’s e-book landing page template to save time. I’ve been blown away by the sheer power of webinars to produce an avalanche of warm, targeted customers. Like e-books, the success of a webinar will depend on whether it offers anything of real value to people. Only when a webinar is considered to offer value will people happily give you their contact details and information. Of course, in exchange, you have to provide real hands-on training, examples of real-life applications, and real expertise — all while they sit in the comfort of their homes or offices. If you’re looking to host a webinar to generate leads, I strongly recommend asking qualifying questions on the webinar sign-up page to see what your participants want from the activity. You can ask questions to gauge their interest in your products or services, or questions about where they are in the sales cycle. As for hosting the webinar itself, I recommend including these elements. Your topic has to be relevant to your audience and presented in such a way that it sparks interest. In other words, you want to sell it to your audience, whose first instinct will be to think, “What’s in it for me?” Where should you start? Think of an inviting title, provide assets relevant to the subject, and keep your presentation streamlined and on-topic. My webinars generally walk people through a specific set of topics. I tell my audience the topic, but I don’t give away the farm. I want them to attend to learn all the secrets. You also can set aside a few minutes of webinar time solely for a Q&A session, giving your attendees an opportunity to participate and you an idea of what information they’re looking for. The speaker is perhaps the most important component of a webinar. Anything less than a stellar presenter will cause your attendees to multitask or take a break from the session. As such, it’s important to work with someone who’s an expert in your topic, someone who has charisma and the ability to command people’s attention through a computer screen. Recording the webinar lets you evaluate what went right during the presentation and what didn’t. More importantly, recording the webinar allows you to provide a video copy to your attendees or to provide a content offer to registrants who were unable to join the webinar. You can even post it on your website at a later date. You should consider getting feedback from your attendees. Ask what they liked about the topic, presentation, and speaker, and whether they have any suggestions for future webinars. Use this feedback for your future content marketing efforts. Industry events play a key role in any content marketing strategy. I like to think of them as a way to bridge the gap between the online world and the offline one. They let you interact and learn about potential leads in a way that’s just not possible — at least in my experience — through email blasts and social media comments. It may seem odd to introduce real-life events in an article about content marketing, but hear me out. Content is what drives the event’s success, and contributes to its ongoing role in your marketing funnel. Here’s how to use content to prepare for, improve, and follow up on your live event. Talk to your event’s speakers and notable guests through chat/SMS or video, uploading this content on your website and social media pages to generate interest. You should also encourage guests and speakers to share their interview for additional visibility. Create an event hashtag when promoting your event. Not only will this help spur the event to go viral, it also allows you to measure mentions and the spread of your content. Live blog or tweet the event (don’t forget to use your hashtag) and encourage attendees to do the same. You can perhaps offer prizes to lucky participants who upload event pictures on Facebook or Instagram — make sure you repost their posts as well. Upload photos and videos of the event on Facebook, Instagram, Flickr, or some other photo and video-sharing site. Consolidate all content related to the event — articles, photos, videos, and other postings mentioning your event. You can then share your curated content on your official blog, Tumblr, or Storify. Review your event, not just for your sake but for your audience as well. Compare the results of the event with your goals. Were they met? Did the event have any shortcomings? Upload your thoughts to a blog, a vlog, or podcast. Great events are an incredibly effective lead-generation tool, doubling as an opportunity to build your brand and image. Yes, I know: White papers are about as old-school as they come, but they’re still around for a good reason — they work. I agree with Roanne Neuwirth who wrote, “White papers still matter.” You don’t have to call them “white papers,” which smacks of old-school corporate boredom. You can call them whatever you want. The point is this: White paperish (I made that word up) content will generate leads. Title – Catch the reader’s attention right away, all while conveying the paper’s subject matter. Content – Expound on the title, zeroing in on a particular aspect of the customer’s purchase journey (something you’ll have to decide on). Whatever the case, the content has to be helpful even if the reader won’t buy your product or service. Promotional plan – Distribute copies of the white paper to your sales team and run through its content. Include the white paper in your social media outreach campaign, email marketing campaign, or external advertising efforts. Lead strategy – Instead of following up with a “buy now” call to action, you can respond to the lead in the most benign manner possible: offering more information. Perhaps send an email asking if the reader wants to download another white paper, sign up for the next webinar, or join a future event. Case studies can tell stories — good stories. It can be a success story of a product or service, or a solution (or solutions) to a particular problem encountered by customers, complete with the steps to fix the issue. Although many marketers have an aversion to case studies because they’re often boring and uninspiring, they are invaluable in turning plain readers into buying customers. 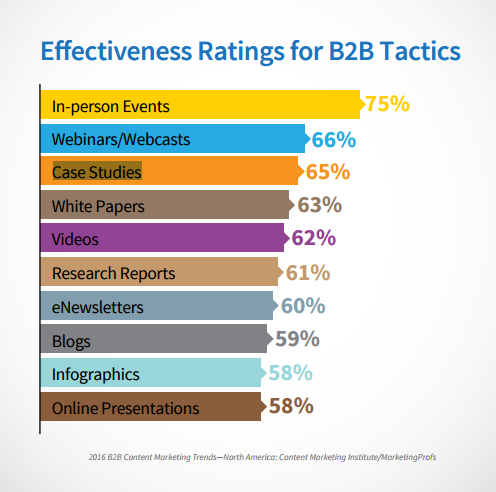 Research indicates that case studies are the third-most effective B2B content marketing tactic. I don’t know about you, but I’m seeing serious leads. Abstract or summary – Begin your case study with a summary of the problem and a preview of the solution or steps taken to solve it. Real people – Genuine interviews are what really make great case studies stand out. A case study needs to tell a story, and that narrative is most effective when it’s told from the customer’s perspective. Photos and videos – Multimedia assets make case studies more engaging, appealing to both oral and visual learners. Charts are especially useful, providing additional background to your case study’s points and making comparisons between products or experiences more effective. Solution – When talking about the solution, keep your broader audience in mind and walk the reader through the steps you took to fix the problem in a clear manner. 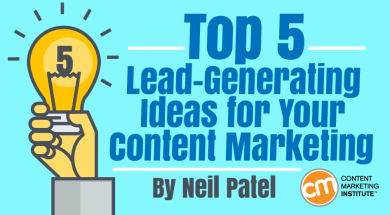 As you may have guessed, there are many ways to use content to generate leads. However, it’s also important to remember that there is no one-size-fits-all solution to content marketing and lead generation. Depending on the nature and industry of your business, one method may be more effective than the other. In addition, you should consider how you’re going to measure your content marketing strategies. 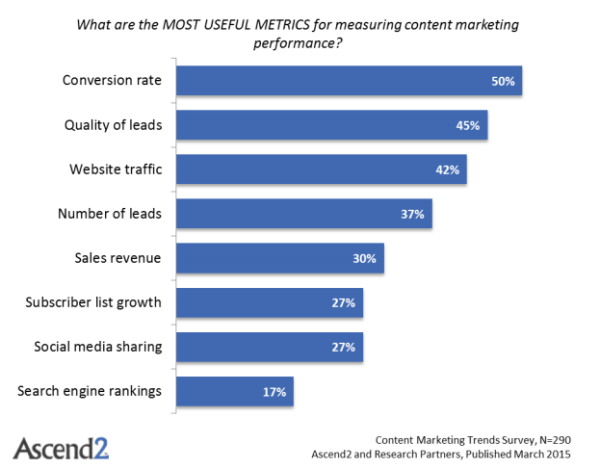 A 2015 report by Ascend2 found that conversion rates are the most commonly used metric for measuring content marketing performance, followed by lead quality, and website traffic. Simply put, before you set out on any lead-generation campaign using content marketing, you need to determine what benchmarks to use to measure its success. In any case, what matters most is that your content drives action and movement. Without it, your content isn’t doing any marketing on your behalf, defeating the purpose of the entire endeavor. What content marketing methods have you found to yield the most benefits? Want to learn more about how content marketing can help build sales leads? Make plans to attend Content Marketing World 2016 Sept. 6-9 in Cleveland, Ohio. Register today and use code BLOG100 to save $100.